Opening this week: Farmiga's feral femme fatale, Herzog at the South Pole, a true-life gay love story, the amazing "Blue Planet" and more. 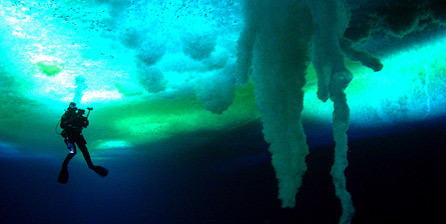 A diver under the ice in Werner Herzog's "Encounters at the End of the World." Since I'm still scrambling to restore some order to my personal and professional life after a month away -- and with 4-year-old twins in the house this is a doomed campaign, I assure you -- here's a cheat-sheet for a few of this week's movies I haven't covered yet. Another much-celebrated documentary from the festival circuit now reaching theaters is Guido Santi and Tina Mascara's "Chris & Don: A Love Story," the story of the passionate 30-year relationship between English writer Christopher Isherwood and the much younger American painter Don Bachardy. A legendary couple in Los Angeles' gay community (and the subjects of a David Hockney portrait), Isherwood and Bachardy were unapologetic public figures long before gay marriage was even imaginable. (And yet somehow the heterosexuals of California survived!) It's now playing at the Quad Cinema in New York and opens July 4 at the Nuart Theatre in Los Angeles, with dates in Boston, San Francisco, Minneapolis, Philadelphia, San Diego, Washington and many other cities to follow. A week-long New York engagement of the astonishing 1982 feature "Blue Planet" anchors a tribute to Italian filmmaker Franco Piavoli, an experimentalist whose work is remarkably accessible because it draws mainly on the natural world. Celebrated by Bertolucci, Tarkovsky, Italo Calvino and others, Piavoli is a major influence on the work of Godfrey Reggio ("Koyaanisqatsi," etc.) if not nearly as well known. Four of his features will play this weekend in a retrospective at Anthology Film Archives, with "Blue Planet" opening Friday at the Pioneer Theater. Finally, in the always outstanding film series at New York's Museum of Modern Art -- something to be grateful for amid the imploding indie-film economy, fellow Gothamites -- it's not too late to see Isaac Julien's "Derek," a tribute to English avant-garde genius Derek Jarman narrated by Jarman's muse Tilda Swinton, which plays through Monday. Beginning Friday, MOMA is also showing "Warsaw Bridge," a purportedly ravishing experimental film by Catalan director Pere Portabella, who encountered a newspaper headline "Body of scuba diver found in burnt forest" and saw a movie in it. I'm sure Scott Rudin and Harvey Weinstein are planning the remake right now.